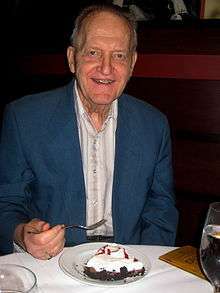 Albert W. Overhauser (August 17, 1925 – December 10, 2011) was an American physicist and a member of the National Academy of Sciences. He is best known for his theory of dynamic nuclear polarization, also known as the Overhauser Effect. Born in San Diego, California, Overhauser attended high school in San Francisco at Lick-Wilmerding High School and began his undergraduate work at the University of California, Berkeley in 1942. He interrupted his studies during World War II for a two-year stint in the U.S. Navy Reserve, then returned to Berkeley to complete his education. In 1948 he received undergraduate degrees in physics and mathematics, and in 1951 he received a Ph.D. in physics. From 1951 to 1953, he was a post-doctoral researcher at the University of Illinois, where he developed an important theory on the transfer of spin polarization; once the theory had been confirmed and demonstrated by other scientists, it became known as the Overhauser Effect. He was on the faculty at Cornell University from 1953 to 1958, and then left to join the research staff at Ford Motor Company. Overhauser remained at Ford until 1973, when he joined the faculty at Purdue University. He remained at Purdue as the Stuart Distinguished Professor of Physics for the rest of his career. Overhauser died in 2011 in West Lafayette, Indiana. He was 86. ↑ "Albert Overhauser Obituary: View Albert Overhauser's Obituary by Journal & Courier". Legacy.com. Retrieved 2011-12-14. Giuliani, Gabriele F.; Werner, Samuel A. (2012). "Albert Warner Overhauser". Physics Today. 65 (10). p. 69. doi:10.1063/PT.3.1758.